Welcome to the Turbo! Team Europe website. Our goal is to support all enthusiasts of classic and modern Saab Turbo's, to share information and experiences about every aspect of owning and enjoying these great cars and to keep the high performance image and motorsport heritage of the make alive and kicking. Most of all, we'd like Saab turboheads from all over Europe to meet, make new friends and have fun in the same spirit as our American Turbo! cousins (http://secret-secret.com/turbo) have been practicizing for the past couple of years. We are planning to organize or be present at events your local or national Saab club won't get into, like modified & performance car shows, car audio sound offs and racing track events. At this site we will provide as much technical information about how to get and maintain the very best performance from your turbocharged Saab as possible, from simple modifications to reports of extensive projects by TTE members. Surf the Web for Saab and performance related information through our 'Links' section which has quickly grown to become one of the most comprehensive around. Bookmark this site because we will regularly update our information and add new items. Also you'll learn everything about the cool, weird and wonderful people of the Turbo! scene in Europe. This page was last updated on 04/30/01. 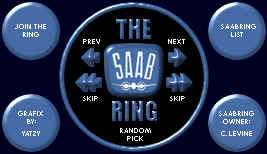 This The Saabring site owned by Turbo! Team Europe. This TSP Webring site: Eric van Spelde.